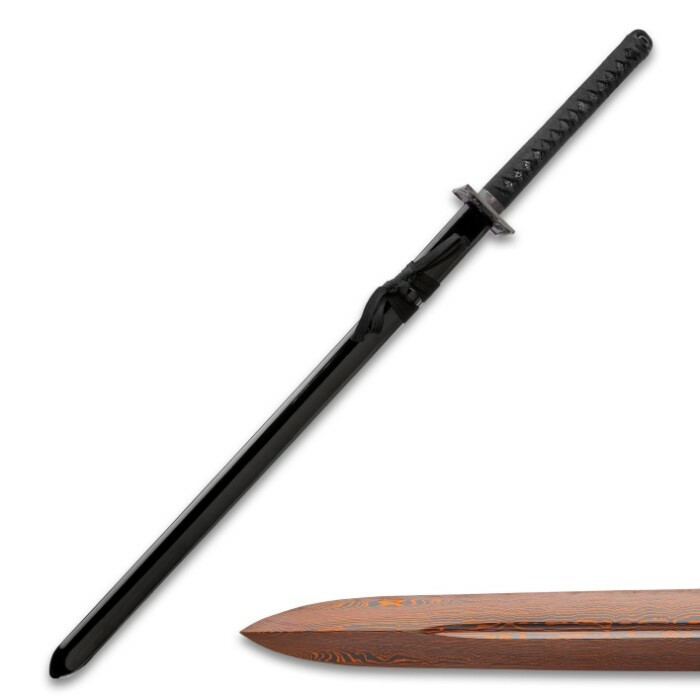 Shadowy and mysterious, yet clearly capable, Shinwa’s “Abyss” Katana is both a black pit of despair and a wellspring of sword-wielding joy; it just depends on which end you’re facing. 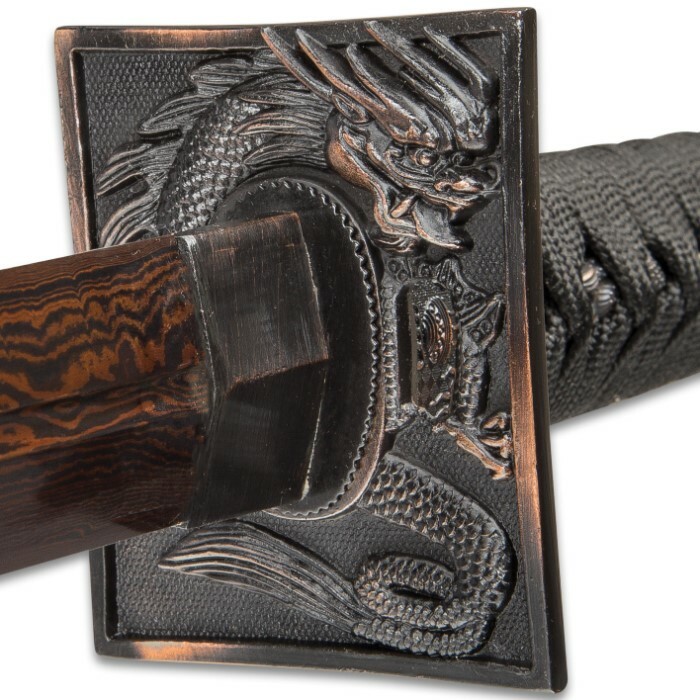 And despite its grim hues, the Abyss is nothing if not vibrant and alluring; it’s teeming with distinctive appointments and captivating accents – a true masterwork of contemporary sword design. But behind this stylishly unsettling façade lurks a downright frightening beast – a formidable double-edged blade hand forged from black Damascus steel. The Abyss’s distinctive black Damascus steel is a tumultuous sea of contrasting lines, waves, swirls and other mesmerizing patterns, all cloaked in a shadowy dark hue. Each line is a distinct variety of steel, hammer welded and hand folded repeatedly to yield the thousands of layers in each Abyss blade. The unique metalsmithing technique’s roots stretch back to the Middle Ages, and today it’s still painstakingly performed by seasoned hands – no automation, no mechanization. To make each Abyss blade, a Shinwa master swordsmith fires a stack of steel blanks - each piece a different alloy - in a white-hot forge until the metal glows red hot. He then removes the stack and hammers it until it’s around half as thick as the original. Then he folds the metal onto itself lengthwise and hammers each half together. The process is meticulously repeated – hundreds of times in some cases – until the desired layering effect is achieved, at which point a final quenching strengthens the resulting blade, while an acid treatment highlights vivid contrasts in the layers. And the slow, laborious process itself it just the beginning! In order to achieve sufficiently dramatic contrasts, Shinwa’s master smiths must expertly select an appropriate combination of steel alloys of varying color, luminescence and other visual qualities. For the sake of strength, resilience and countless additional blade factors, the smiths must also must consider each alloy’s distinct melting point, proper stacking order, forge temperature and myriad other variables. Simply put, an unbelievable quantity of blood, sweat and tears goes into every Abyss blade. 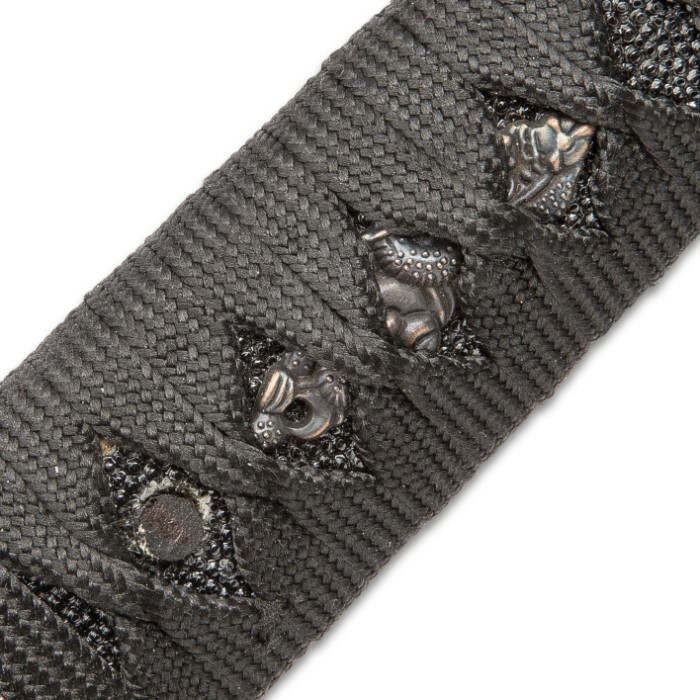 As if that weren’t enough, Shinwa adds its own innovative modern twist to the Abyss blade - an exclusive, closely guarded secret process that imparts that sinister dark veil; putting the “black” in black Damascus, so to speak. Rich amber lines swirl over a deep black void like trails of blood flowing down a blackwater river. It's Damascus steel...after dark. And of all the world’s swords, Shinwa’s Abyss is one of a relative few to feature it. Furthermore, like a steel snowflake or fingerprint, the patterning on no two Abyss blades are exactly alike. 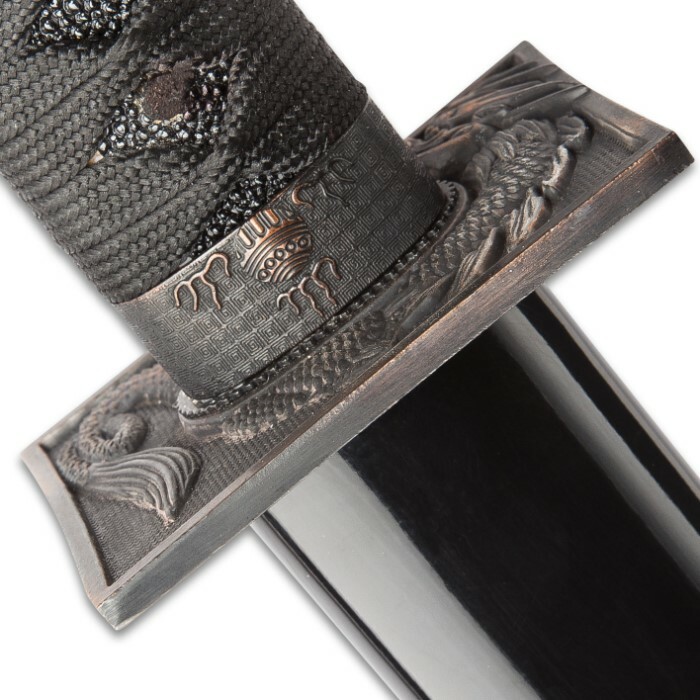 Even the most sumptuously adorned, expensive “carbon steel” sword can’t match the shadowy allure of Shinwa’s double-edged dark wonder: the Abyss Katana. Like a seaside lighthouse in photonegative, the deep, dark Abyss is a brilliant shining beacon of originality and inventiveness in a sea of ordinary, uninspired swords. The Abyss has proven itself time and again, and it holds its own against far more expensive katana, outperforming many. But the old cliché is true - "action" does indeed "speak louder than words," and at this unbeatable, downright unheard-of price, why deny yourself the opportunity to experience the ever-impressive Abyss Katana for yourself? No matter how you use it, with proper care you can enjoy the Abyss for a lifetime, then pass the set down to your children, grandchildren or great-grandchildren! 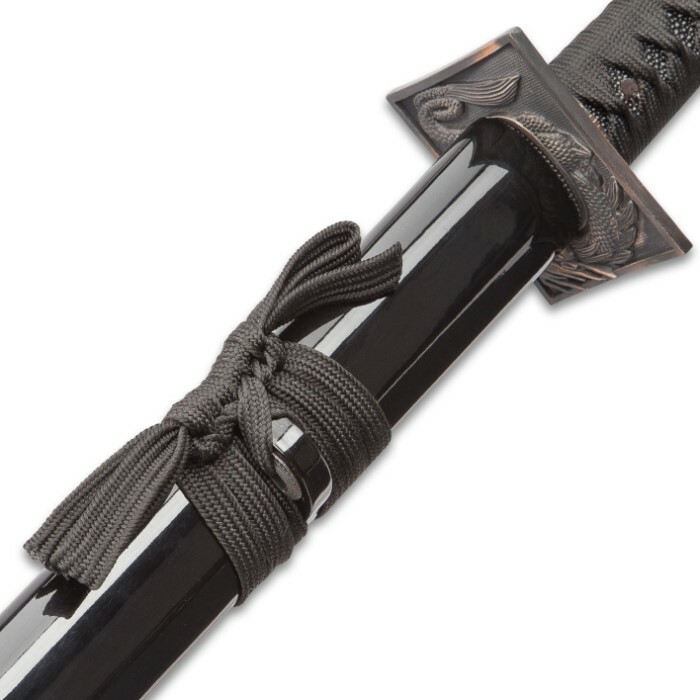 This heirloom-quality katana is built to be treasured by generations of your descendants - your legacy preserved in hand forged black Damascus steel! I got this today. It was like Christmas. I opened the box, to find a beautiful display box inside. I opened the display box to find the sword wrapped in a black bag. The anticipation was driving me crazy. I took the sword out of the bag and found a very beautifully crafted sword. The edges weren't razor sharp, but i can fix that. overall the sword is beautiful. It has a nice weight to it. I feel it is a Great sword for the price. no problems with this sword at all. i love it. I bought this sword a couple months ago and was surprised at what I found. The sword had plenty of glue at where the blade entered the handle, and sawdust regularly gets stuck on the blade from the scabbard. It also isn't real damascus steel, just a coating made to look like one. The blade is a bit weak and when put against my 1942 U.S. sword it was easily chipped. The box is cheap and it is easy for the fabric on the inside to slip and for the styrofoam to come out. You can also clearly see the wood of the handle because the cord wrapping doesn't cover it. It seems weird to me too that almost every review here has 5/5 stars, even the ones where they only say that it is terrible. This review is 1/5. Absolutely love this sword, its easily the favorite of my collection. If I absolutely have to find a complaint, its that i dont like the box it comes with, but to be honest its not that bad; it just gives it an older Asian feel. Its not a bad thing, it just looks out of place. But the blade itself was perfect! Super sharp on both sides, and i love the color! I dont have a problem with the square guard, not sure how it would hurt you really. And the scabbard is pretty nice as well. It does have weight to it from the full tang and it is real Damascus! I own several Damascus products and this is by far my favorite, totally worth it! Great blade, strong and heavy,good scabbard,,also the handle is well wrapped. I just wish that this blade came with a smooth, rounded guard. The square guard has sharp corners that hurt. I got ne of these, sending it back,,,Looks fake to me,,, like a coated carbon steel blade, not real Damascus steel. I finally got this sword almost half an hour ago, and I must say I am satisfied. 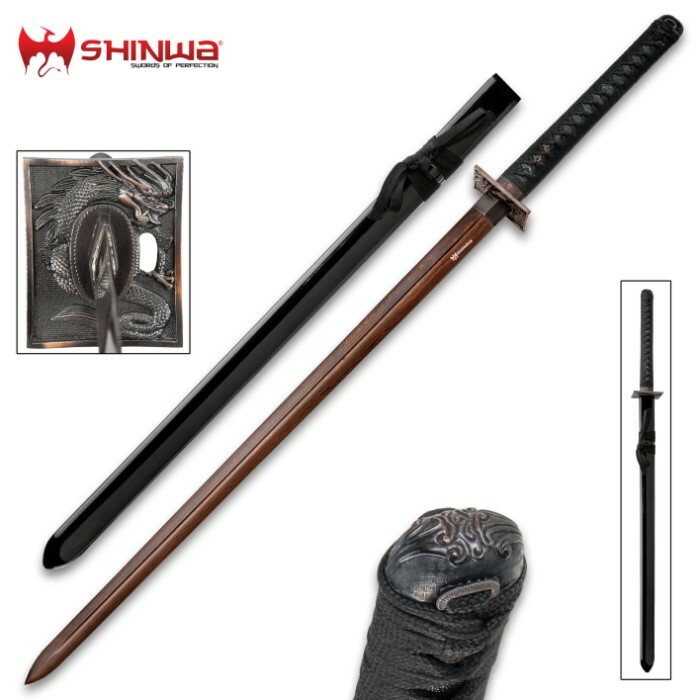 I'll admit that after reading the reviews that gave this sword a bad rating, I was scared to buy it. But now, I can let out a sigh of relief. This weapon is even better than Trueswords described it. The black blade is super sharp, everything on it is really tight so nothing on it is wobbly or can move freely, and it's surprisingly heavier than I expected. But I know the extra weight is from the full tang, which makes this sword even stronger. I highly recommend this weapon. This gets a 5 out of 5. Everyone loves what you guys are up too. This sort of clever work and coverage! Keep up the amazing works guys I've included you guys to my personal blogroll.